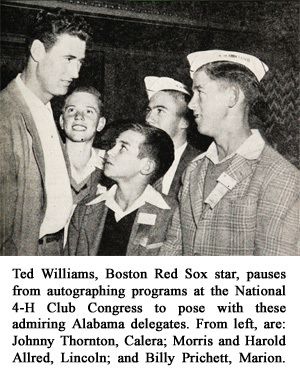 This story was published in National 4-H News following the 1947 National 4-H Club Congress, written by Robert Chesnutt, Assistant Extension Editor, Alabama. The theme of this story about our Alabama delegates could be repeated over and over by others struck with the eagerness of youth to accept new ideas, encouragement, strong leadership. Our boys and girls hadn’t missed a session, not even a word uttered by outstanding speakers. They absorbed the entire program. I know. They talked with me about every meeting. Then at one of the dinners given by a generous sponsor, their enthusiasm was fired higher and higher. It reached the bubbling-over point. At this event rumor got around that top-flight athletes would appear on the evening program. Immediately every member of our group wanted autographs. They soon located Charlie Trippi, Chicago Cardinals, and Ted Williams, Boston Red Sox (both later Hall of Famers) at the table across the spacious Stevens Hotel Ballroom. They got the signatures and then said they would be ever-grateful if the stars would pose for a picture with them. True sports that they are, Trippi and Williams laid down their forks and obliged. That was the happiest bunch of boys I ever photographed. Upon receptive, eager ears fell these lines that had followed other inspiring words of a dozen speakers of previous days. They were drunk, deeply drunk, by kids who would hold on to them forever. Those words and those boys and girls became inseparable. Neither could escape from the other. The ringing challenge would return later down in some Alabama cotton field. It would come again to haunt and inspire a boy who found his beef cattle project heart-breakingly tough. It would sound again and thrill a wisp of a girl whose eyes were filled with sweat from standing over a red hot stove, canning food for winter. Yes, some words never die. They become as much of the one inspired as he is of himself. Those were some of the things the sincerest kids I ever knew told me that night. Nimrod, already a State champion, was echoing the spirit he found at the Congress. Perhaps he would have said the same, Congress or no Congress, but I can’t think so. Lucille said it in a matter-of-fact way. But meant every word. Knowing how far down the line she started and how high she’s climbed, I say she’ll do it, too. The words and inspired faces remind me over and over that at every crossroad are growing our future wealth. How well we succeed lies in how well we kindle in our youth the fire that keeps them pushing towards new victories in the smaller accomplishments in life: Sewing a better dress, canning a better jar of food, growing better corn, taking a fuller part in leadership. Inspiration may come at a National Congress – but just as surely it may come in the smallest 4-H meeting; or at a home visit by the county Extension agent; or when an older member helps a beginner. When or where youth is inspired is not important. The fact that they can be as inspired as their leaders have the vision to make them is the secret to better 4-H work – and a better world.